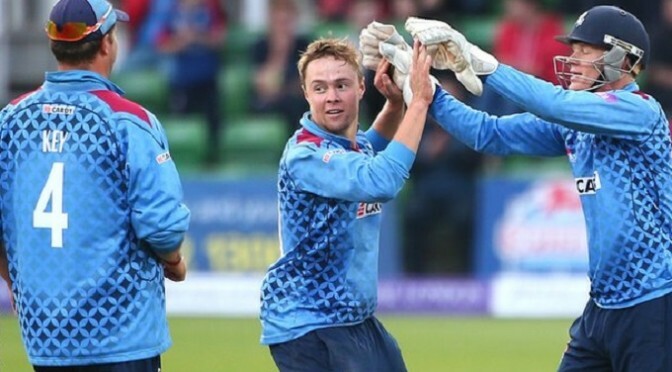 Kent booked their place in the One-Day Cup semi-finals with a 24-run victory over Gloucestershire. After the hosts lost Rob Key and Ben Harmison cheaply, Sam Northeast (78) and Fabian Cowdrey (51) put on 106. Sam Billings added 61 but Kent slipped from 215-4 in the 43rd over to 242 all out as David Payne finished with 5-44. Chris Dent (40) led a positive reply but Gloucestershire lost their way and, despite Will Gidman (39) giving them hope, they were dismissed for 218. Kent will now travel to Edgbaston to meet Warwickshire on Thursday, 4 September in the last four for the right to earn a place at Lord’s, while the other semi-final sees Durham host Nottinghamshire two days later. The hosts were inspired by Billings’ 36-ball innings as he hit three sixes and seven fours to put his side in a position for a big score with six overs remaining, but Gloucestershire fought back well to take the final six wickets in 37 balls. In reply, William Tavare (19) and Dent put on 46 for the first wicket in 8.2 overs and Gareth Roderick added 43, but the visitors then slumped to 125-6. A seventh-wicket stand of 53 between Will Gidman and Benny Howell (33) briefly raised Gloucestershire’s hopes, but Harmison (3-40) and David Griffiths (2-36) helped mop up the tail order and Kent could celebrate a semi-final place.